At Hertford St Andrew we strive to deliver an exciting and varied curriculum which will engage and challenge our children. Our teachers use a variety of resources to keep our units of work current, exciting and appropriate whilst ensuring we meet the statutory requirements of the curriculum. English as a subject is truly cross curricular and you can see our celebration of writing displayed regularly throughout the school. The study of English develops children’s ability to listen, speak, read and write for a wide range of purposes. The use of written and verbal language in the classroom enables children to communicate ideas, views and feelings creatively and imaginatively. As they become enthusiastic and critical leaders of stories, poetry, playscripts, non-fiction and media texts, children gain an understanding of how language works. Children use their knowledge, skills and understanding in speaking and writing across a range of different situations. The School Run A site designed to support parents who have children of all ages in understanding the finer points of school life. English Curriculum This is a direct link to the English curriculum which will show the requirements for the subject in all schools. National Curriculum An overview of all curriculum requirements in Primary Education. Primary Resources An excellent site for resources to support your children in all curriculum areas. BBC Bitesize A good site to give an overview of fiction and non-fiction texts. 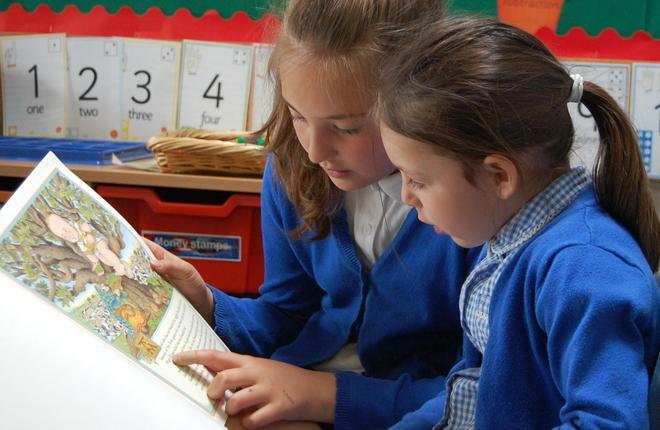 The School Reading List Identifies a range of reading materials for all ages of children. Includes writing competitions and other challenges to support English. The Book Trust Inspires and supports a love of reading. Lists books by age bands including lots of your children’s favourites.